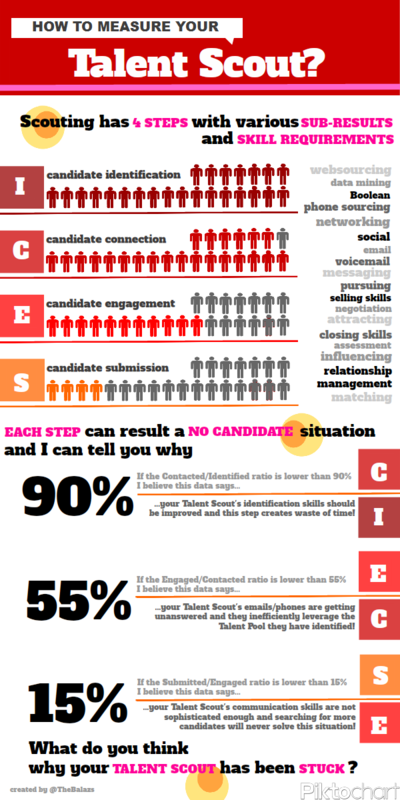 What is the primarily goal of a Talent Scout? You may say: it is certainly the hire. But can a Talent Scout/Sourcer be fully responsible for the hire if the recruiting mix contains more channels than only the traditional direct (‘passive candidate’) sourcing? Certainly not! If it is not necessary the hire that makes a Sourcer successful (recognized?) what is the measurement of their success? And vica versa: if a Sourcer seems to be not efficient enough what is the measurement that will tell you why your Sourcer has got stuck? With my ever first INFOGRAPHIC I present some new measurements that you can apply. I have been working with them for a while and if you are comfortable with this data-driven approach it can be a rather helpful tool to quickly understand where your colleagues are. Go for it! …and let me know your thoughts.